Brookfield Guest HouseWelcome to Brookfield 4 Star Rating B&B Guest House Keswick, in the Northern part of the English Lake District. If this is your first visit to Keswick and the English Lakes, Simon and Lorna can offer you plenty of advice on walks, drives and places to eat and drink. 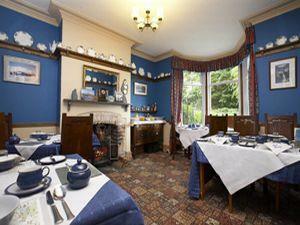 The B&B is located in a in a quiet area on your approach to Keswick town Centre and the beautiful Lake Derwentwater. Breakfast is served from 7.30 am until 9.00 am. Vegetarian and Special diets catered for. Free Parking opposite the B&B in the side street which, also leads up to the Historical Castlerigg Stone Circle, ( only 20 minutes walk away). Well behaved pets accepted by prior arrangement with an additional charge of 5 pounds per dog per night. Guest are asked to bring their blanket, doggie bed and bowls. Brookfield sometimes limits bookings to 3 or more days. From M6 jct 40 at Penrith, Keswick is 17 miles along the A66. Take the Windermere/Keswick slip road marked A591. Brookfield is 800m on the right-hand side, opposite the turning to Castlerigg Stone Circle. From M6 at jct 36 then Keswick is 35 miles up the A591 through Windermere, Ambleside and Grasmere, a more scenic tour. On approach into Keswick down the hill, take the 1st main turning on the right to Penrith/Cockermouth. Brookfield is 50m on the left-hand side. Those of you who are planning to use public transport to reach us should phone us in advance, to get directions. Thankyou Corinne. It was lovely to meet you all and really pleased you enjoyed your stay with us. Kind Regards. Simon and Lorna.